We made it out to Summerfest on Friday for lunch and shopping. We spent about three hours at the fair, during our two-year-old's naptime, so in the end he had a meltdown before we were able to look at about 25% of the booths. I wonder what we missed, but we did see a lot and have fun! Check out my photos (yes, my child thinks he's a pirate), then read on to learn more about what we saw and to find out what I chose to eat at the fair. We parked a couple of blocks north of the fair and upon our arrival at Tabernacle Square we made a lap around the food vendor area to assess our options. I ordered a Spicy Vietnamese Pork Wrap from Culinary Concepts, which was thinly-sliced pork surrounded by lime-scented carrots and other veggies, as well as herbs and a savory sauce. I added some Sriracha hot sauce, one of my favorite condiments, for the perfect finishing touch. Boy it was a mighty fine sandwich! Probably the freshest, "cleanest" fair food I have ever tasted. It was reasonably priced (as far as fair food goes, which is a notoriously expensive) at $5. The Korean Spicy BBQ Beef Taco I had anticipated based on the information on the Summerfest website was not on the menu, but I was very happy with my choice. Tyson chose a Gyro, which he said was good. It looked filling. Choosing food for our boys proved to be difficult. I think they would have eaten corn dogs, but they cost $5 apiece! Ouch! My kids like to eat healthy foods at home, but the wraps and sandwiches at Culinary Concepts were the only healthy items available, and my son turned down that option and asked for peanut butter and jelly. The only PB&J available was at the Navajo taco stand, so it was made on fry bread. We bought one for $3.00, as well as a fry bread "pizza" (ordered with cheese and sauce only) for $3.25. I don't know if I could have given them anything messier! A substantial disk of fried bread, slathered with jelly and a huge amount of chunky peanut butter. The bread was right out of the fryer, and was very hot when the toppings were applied, so the jelly and peanut butter melted and ran everywhere. It wasn't much to look at, but it tasted great! Completely decadent and something you know you shouldn't eat often, but worth having in the moment. My older son loved it and managed it pretty well once I tore pieces of and folded them so the jelly and peanut butter stayed where they were meant to. The pizza wasn't as good, but you really can't go wrong with fry bread. Because I ate a significant portion of the fried peanut butter and jelly sandwich, I forwent my beloved mini donuts. Don't doubt I will get some at the Cache County Fair in August! After lunch we browsed the artists' booths and took a breather in a statue area on the west side of the Tabernacle. One of my favorite booths was that of glass artist Nikki Root. She created decorative stained-glass pieces using vintage bottles, vases, plates, etc. 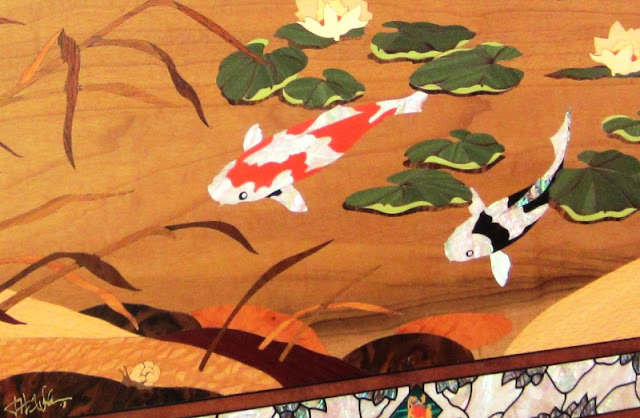 I also liked the work of an artist who did very detailed scenes in wood inlay. And of course we loved visiting Tyson's cousin Josh's booth, where we bought a few pieces. Anyone else head to Summerfest? What did you eat? What did you buy? So excited that you have started this blog! I will definitely be coming here for ideas. You have already posted so much! Wow! We also made it to Summerfest -on Thursday evening. I love artsy-fair kind of things (St. George does one every April which we faithfully attended growing up), and Summerfest has an awesome variety of booths and food. The tabernacle ambiance is also great. I tried a brisket sandwich with cabbage from Savanna's BBQ (been there?) which was filling in the way that only several inches of thickly sliced meat can be. Dave had Jack's pizza with homemade rootbeer (love that pizza. do you?) and we also got some cobbler from the Dutch Oven place. (I too have a weakness for scones, btw) :) Was there any good live music while you were there? I also saw the intricately carved wood art and liked it. I would love a stained glass piece to hang in my kitchen someday. The heat was a bit overwhelming (we all got sunburnt), and Peter had a meltdown on the drive home, but glad we made it out. (I think it just seemed worse than it was since last year when we went it was sprinkling, very cool, and not at all crowded). On a total side note, I was thinking it would be fun to start a Devonshire "water days" where we'd just set up a couple kid pools and a snack table once a week. What do you think?